CDU Master of Visual Arts student Caroline Rannersberger is exhibiting her work Sublime Territory at the Araluen Galleries at The Alice Springs Cultural Precinct. Her exhibition explores the ‘post-modern sublime’ through landscape as a metaphor for society and cultural politics. In order to challenge colonial conventions of society and interrogate forces of globalisation, Caroline borrows 19th-century representations of the sublime and also draws on her German heritage. She uses 16th and 17th century interpretations of German engravings, including the literary character, Simplicissimus and Albrecht Dürer's Monstrous Sow of Landser. The exhibition comprises a unique combination of multi-panelled printmaking, drawing and painting works on paper. Caroline says the images represent the good and evil in ourselves and in society through notions of exploration and globalisation. She was originally invited to exhibit a work in the Alice Prize and later applied to exhibit further works at the Araluen Galleries. ‘It's fantastic to have such supportive and highly professional staff at Araluen who take a real interest,’ she says. Caroline gained approval for the exhibition to be the final examination for her Masters thesis. 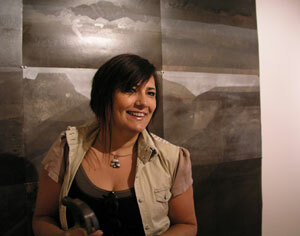 Alice Springs artist Rod Moss and Darwin CDU art theory lecturer, Dr Sarah Scott, will formally assess the exhibition. The exhibition is supported by Charles Darwin University, Sydney-based Thirtyseven Degrees Contemporary Fine Art Gallery, Alice Springs Cultural Precinct and the Northern Territory Government.